We are still at the dock at Lyons, but we hope to move on tomorrow. (I have MANY technology updates in store for you!) Today I biked the canal towpath back to Newark, to check out the farmer's market. This was more than a practical trip for me. It was an homage. My dad, Jay Berger, who passed away this past January at the age of 91, was a history buff and, late in life, a cycling enthusiast who dreamed of biking along the Erie. We tried to make it happen, back in May 2010. 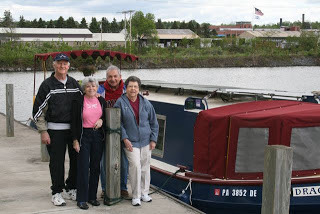 Dad, Mom, and their friends George and Edie came for a three-day cruise and bike tour. Dad and George biked along the canal path from Macedon to Palmyra and, next day, from Palmyra to Newark. But then weather intervened: sleet and freezing rain, gale force winds. 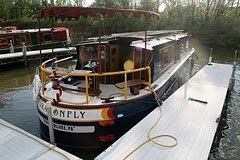 So the bikers boarded the boat, and had a cozy cruise, with the propane cabin heater blasting and the Scotch flowing. We all had fun. But Dad didn't get to do all the biking he had planned. Today I biked the section he missed, thinking of him along the way. The path was a cool, green tunnel formed by walnut and sumac trees. The canal was always in view, crossed here and there by antiquated single-lane bridges, like tinker-toy constructions. And at each end of the segment was a lock, with bright-yellow-painted railings and cobalt-blue-painted machinery, a four-square white 1920's-era locktender's house, flags snapping in the breeze. Dad, you would have loved it. The map below shows our route over the next week or so. Come visit! All of these destinations are less than five hours from State College, friends! You could birdwatch while cruising through the Montezuma Wildlife Refuge, near the town of Clyde. 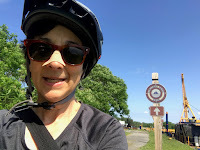 There's a nice bike path from Weedsport to Baldwinsville. Oswego is a fun college town with a historic fort and a few funky little museums. If you're tempted, let me know and we can figure out a visit! Wonderful tribute to your father. 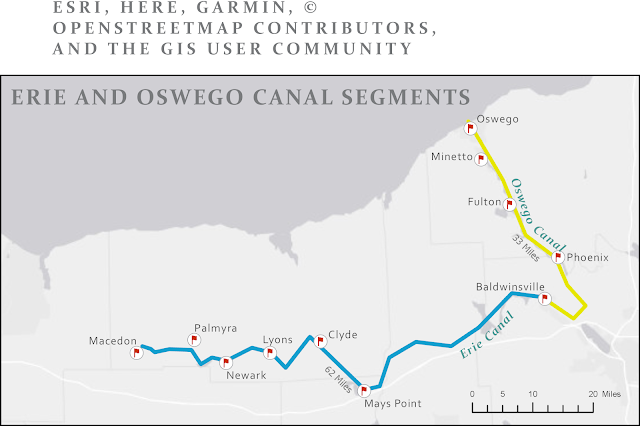 I rode the Erie Canal ride from Buffalo to Albany in 2007. It was a great ride that I enjoyed immensely. I wish that I could come and see you but I will be on a bicycle sojourn on the Delaware and Lehigh Rails to Trails. Enjoy your journeys. So neat that you've biked the entire canal! Have fun on your bike trip and share pix!